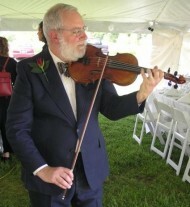 I just wanted to thank you for the beautiful music for my daughter's wedding on Sunday. You and Mike hit just the right notes to make the evening memorable. I won't be holding another wedding in NY but I'd certainly call you again if I was. Feel free to use me as a reference if needed. I have gotten so many compliments on your music. I think it was just perfect, and what I had in mind. You really added that special something to our day, and we thank you for that. That was lovely. We really enjoyed it. Everyone loved it and was happy. We have had a number of requests to hear samples of our music. To respond quickly we have put up recordings of some of our numbers. These appear as links in the tables below. They should play in your Windows Media Player. and plan to improve them soon. and other music for your wedding reception.